Prime Minister Benjamin Netanyahu on Sunday said the government would not fund boycotts from within against the State of Israel. He was referring to the protest of several Israeli artists, who declared over the weekend that they would refuse to perform in the new cultural hall in the city of Ariel, which is located beyond the Green Line. "The State of Israel is subject to a de-legitimization attack on the part of different elements in the international arena, including attempts to launch academic and economic boycotts," Netanyahu said. "The last thing we need now is an attempt of boycotts from within." The prime minister added, "I don't want to revoke every artist's right for a political opinion, but we as a government should not fund boycotts against Israel's citizens. I was happy to hear from the culture minister that other artists announced they would perform as planned. That's the right approach." Finance Minister Yuval Steinitz said the government should withdraw funding from theaters which refuse to perform in Ariel. "The State of Israel invests a lot of money in theaters. The taxes helping those theaters exist are paid by Ariel's residents as well, and those who are sabotaging this should not be employed in Israel," the minister said. "What next? They'll refuse to perform in front of haredim? This is a case of unfounded hatred. Ariel is a community in Israel, just like Beersheba or any other Arab community. At the end of the day the theaters will perform in Ariel, and I hope that those who fail to fulfill their contracts will be removed from the theater. There's a limit to everything." Science and Technology Minister Daniel Hershkowitz believes the boycott will only hurt the artists. "I am sure that suitable alternatives will be found to artists who refuse to perform in Ariel, but I'm not sure they will find an alternative audience for their performances," he told Ynet at the start of the cabinet meeting. "I regret the fact that people mix culture with politics. I heard that at least one of them did not even serve in the army. This demand is inappropriate." Meanwhile Sunday, Ynet learned that the Yesha Council was considering boycotting the artists who signed the letter, as well as the shows they perform in. The settlers' leaders believe that such a move would be backed by a large party of the Israeli public, particularly in light of the strong opposition to internal boycotts. "It's sad that while the State is facing a serious battle and calls for de-legitimization worldwide, people from within are calling on soldiers to refuse orders, not to serve in the IDF, and are asking the people of Israel to boycott 365,000 residents living in Judea and Samaria," said Yesha Council Director-General Naftali Bennett. According to Bennett, "The greatest disasters that have struck the people of Israel were the result of unfounded hatred and factionalism. Therefore, the most appropriate response is for the people of Israel to flock to the beautiful city of Ariel in masses." The boycott initiative was also slammed by Tel Aviv Mayor Ron Huldai. "Those who work in a theater financed with public funds cannot refuse to perform in places decided by the theater's management," he said in response. "I have backed the freedom of speech and artistic repertoire together with the theater's management all along. We'll continue to do so and insist on the right of every artist and actor to express their opinion anywhere and from any stage, including in Ariel," Huldai stressed. "A person who is part of the public system and works must respect the management's decisions." Culture and Sports Minister Limor Livnat on Saturday called on managers of theaters supported by the State to "immediately help solve the crisis created, after actors and artists decided to divide the Israeli society." The minister added that "this serious act creates a rift in the society and discriminates against audiences according to the artists' political opinions. Culture is a social bridge and the political argument must be left outside the arts and culture." Ynet reported Friday that a long line of actors and artists from all fields of the theater industry sent a letter to the boards of Israel's repertory theaters, announcing they would refuse to perform in the new culture auditorium in Ariel. Knesset Member Zevulun Orlev (Habayit Hayehudi), chairman of the Knesset's Education Committee, said he would convene a meeting on the matter, while other politicians called for a counter boycott against the artists who signed the letter. MK Orlev denounced the letter, saying that "this is a clear anti-cultural act, which boycotts hundreds of thousands of Israeli citizens living in legitimate communities in Judea and Samaria. I condemn the theater people using their positions in the theater for a political struggle against Israeli citizens." Ynet has also learned that the Cameri Theater of Tel Aviv foresaw possible objections to performing in Ariel, and included a special clause in the in its contract with the theater protecting itself in the event of a boycott. "It is hereby emphasized that, in the event that an actor or actress refuses to perform in Ariel, the theater is entitled to find them a replacement, if possible, or cancel the play. In the event of a play's cancelation due to actors' refusal to perform in Ariel, legal action cannot be taken against the Cameri for damages, expenses, etc," the clause said. The theater confirmed the existence of this clause and a Cameri source said, "It is indeed an exceptional clause, but since it's the first time the theater was meant to perform beyond the Green Line, it was meant as a preventive step." Cameri Director Noam Semel added, "We predicted that there may be objections." In response, Ariel Turgeman, director of the new Ariel cultural center, denied the existence of such a clause. Later, after an examination, he said, "The Cameri has no document with such a sentence with my signature on it. Contracts change all the time. I did not encounter such a contract, and in any case it is invalid to me." It should be noted that the Cameri is the only theater to include such a clause in their contract. 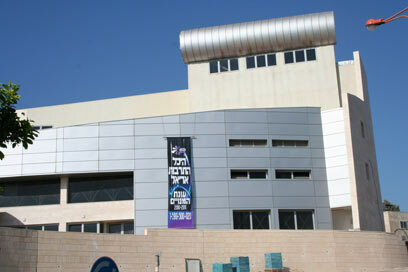 The Habima Theater told Ynet on Sunday that a contract has yet to be signed with the Ariel cultural center. The Beersheba Theater stressed that its contract with Ariel is standard with no changes. The Beersheba Theater's director, Shmulik Yifrah said, "The contract does not refer to Ariel as a different city. As far as we are concerned, Ariel is like any other city in Israel. The Beersheba Theater will perform in Ariel, as it is part of the culture map and we are a public theater. "The artists' protest is legitimate and I have no intentions of forcing them to perform. However, according to the contract we are entitled to appoint replacements. As of yet, I haven't directly received any notice from artists or actors planning to refuse to perform in Ariel. See all talkbacks "Ministers slam artists over Ariel boycott "